Merger monday is back with a bang, when moments ago Microsoft announced that it would buy LinkedIn for $196/share, a massive 50% premium to the Friday closing price of $131. The total deal size is $26.2 billion and according to the press release, MSFT will finance the transaction primarily through the issuance of new debt. 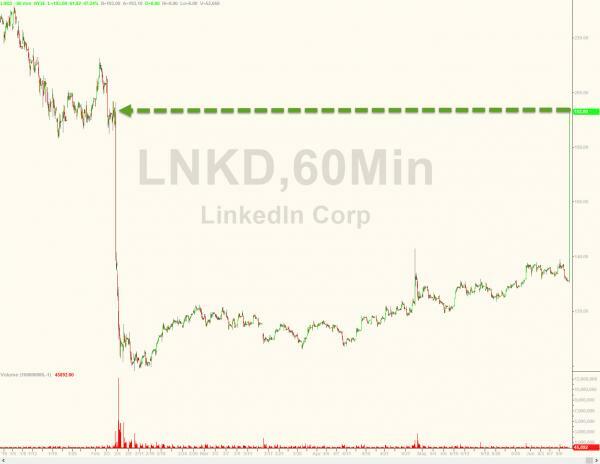 Indicatively, almost exactly one year ago, LNKD was trading at $300. Microsoft, which will pay a $725 million termination fee if the deal does not go through, warns that the deal will only become accretive in 2019. This means many synergies are coming for the tech company. Microsoft also reiterated its intention to complete its existing $40 billion share repurchase authorization by Dec. 31, 2016. Microsoft and LinkedIn Corporation on Monday announced they have entered into a definitive agreement under which Microsoft will acquire LinkedIn for $196 per share in an all-cash transaction valued at $26.2 billion, inclusive of LinkedIn’s net cash. LinkedIn will retain its distinct brand, culture and independence. Jeff Weiner will remain CEO of LinkedIn, reporting to Satya Nadella, CEO of Microsoft. Reid Hoffman, chairman of the board, co-founder and controlling shareholder of LinkedIn, and Weiner both fully support this transaction. The transaction is expected to close this calendar year. Other social media stocks, including TWTR, FB and YELP all jump in sympathy on the news. The acquisition takes the LNKD price back to that February earnings announcement when LinkedIn’s stock price plunged over concerns its growth had sharply slowed. In agreeing to the MSFT deal, LNKD implicity admits that all those concerns were founded as it would not agreed to this deal, and its 50% premium if it expected a return to growth rates which the market was priced in when LNKD was trading at $292 last year. MSFT is halted although many will wonder just how concerned about its own growth is the tech giant if it has to resort to such a dramatic pivot into social media.